Perfect vacation location! Two minute walk to tennis and pickleball courts, restaurants and golf on award winning Palmetto Dunes Plantation. Back yard paradise with 30' heated pool with spa, golf putting green, deck, screened porch and second level sun deck. Spacious interior with 5 bedrooms decorated in gracious Southern charm. Loads of extras including 7 bikes, 2 kayaks, large Weber grill, hammock, lots of beach chairs and pool toys. Sunny vaulted family room with 55' flat screen smart TV. Huge, well equipped 20' kitchen with stainless steel appliances. The dining room seats 6 with an adjoining breakfast room seating 6. The bedrooms include Charleston Summerville master suite with a king bed and private bath with furniture quality granite double sink. The Augusta Room has a queen bed and shares a Jack and Jill bath with granite double sink with the Nautical Room which has 2 twin beds. Completing the downstairs is a half bath with granite sink convenient o the pool area and a sitting area with a hand painted Charleston mural. Upstairs is the Hemingway Room with a queen bed and private access to the sundeck overlooking the pool. This room also has a charming sleeping nook with toddler bed. The fifth bedroom is the Lighthouse Keepers Cottage featuring twin beds. Completing the upstairs is a full bath. We are third row ocean so a nice short 2 minute walk across a wooded lot from the pool area brings you to the beachfront homes and private beach. For outdoor relaxing you'll find 3 dining areas - an umbrella table for 6, elevated bar table for 4 and child's picnic table for 4. For sun worshipers there are 6 poolside chaise lounging chairs and 2 chaise lounges on the second level sundeck. Adding to the fun is a synthetic professional grade putting green, lighthouse corn hole game, rope hammock and box full of pool and beach toys. Outdoor shower, adult 2 person kayak, youth single person kayak and 4 adult bikes + 3 small children's bikes for exploring the island. For your indoor entertainment we have 7 TVs, DVDs, VCRs, toy chest full of fun toys, games and books. Pool and or spa can he heated for an additional fee. These are 'Owner Direct' rates! Gordon and Karen Barber live in Alpharetta, Georgia just outside Atlanta. They met at the University of Maryland where Karen was an undergraduate and Gordon after serving as a US Army officer was a graduate student. Gordon is a 1970 graduate of The Citadel and a retired AVP with AT&T with 41 years service. He is originally from Hendersonville, NC. Karen graduated from USC in Columbia in 1975 and is an author and a contributing editor for Guideposts Magazine. She grew up in Accokeek, Maryland. They have three sons, Jeff, Chris and John, daughter-in-law Leah, daughter-in-law Bailey, grandson Reed and granddaughter Kendall all of whom live in the Atlanta area except John and Bailey who live in Baltimore. Jeff is a Duke under graduate and Duke MBA graduate, Chris USC in LA undergraduate and Emory MBA, John and Bailey UGA graduates and Leah a Ga Tech graduate. Our family vacationed in Hilton Head and rented homes in Palmetto Dunes for about 6 years before we purchased 18 Mooring Buoy. We found the area to be an ideal vacation spot for families especially with children and/or grandchildren. This location is private yet within walking distance to world class golf course, world class tennis facility and much more. Location. Location. Location. We are a 2.5 minute walk to the beach, 2 minute walk to the PD tennis and pickleball court center, 3 minute walk to Trent Jones Golf Course and 3 minute walk to restaurants. The ocean, private pool and spa are magnets for all. We enjoy bike rides throughout Palmetto Dunes, boating on the lagoons, tennis, grilling outside and dining in our favorite restaurants. We provide bikes, kayaks, corn hole, putting green, screened porch, private sun deck, private heated pool, SPA and every kitchen utensil you can imagine. 3.5 baths. 1st floor Master room private bath granite top furniture quality double sink. 1st floor Augusta/Nautical room Jack and Jill bath granite top furniture double sink area separate from toilet bath area. 1st floor half bath with granite top furniture quality sink convenient to pool. 2nd floor Hemmingway/Lighthouse share full bath. 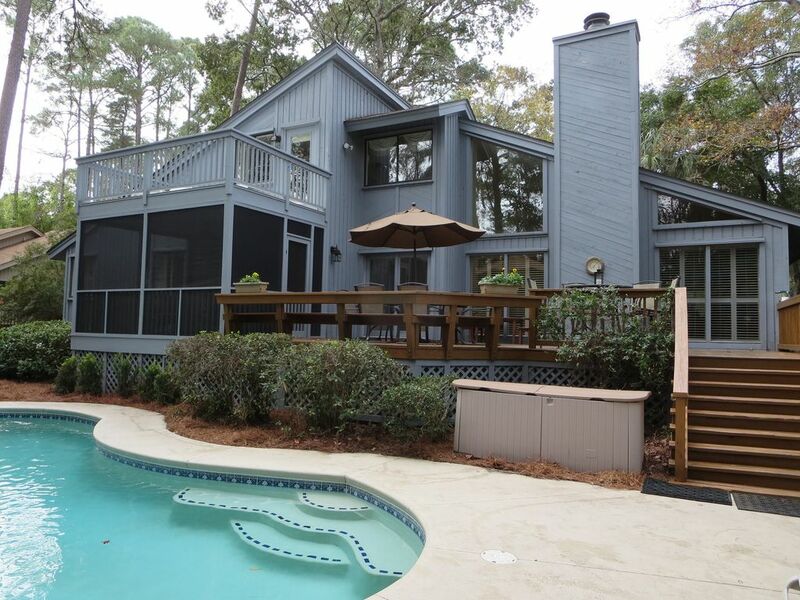 Located on third row with a 2 minute leisure walk from our backyard pool across a wooded path to reach the beach. (4) Located in kitchen, Charleston Master Suite, Hemingway Bedroom and Augusta Bedroom. All sheets and pillow cases are provided. Starter supplies of soap, tissue, paper towels. Large stainless steel with automatic ice maker. Crushed or cubed ice + cold water dispenser. Small refrigerator for beverages. Stand alone ice machine producing 66 lbs. of ice per day. Stainless steel built in microwave. Large 20' Kitchen with room for all your cooks. Sandstone Corian solid surface counters, double sink with sprayer and garbage disposal, ceramic cook top with downdraft vent and bridging element for a griddle, built in oven and microwave, two large pantry cupboards, dishwasher, window over sink. Programmable coffee maker with automatic cutoff, 4 slice toaster, blender, electric mixer, electric can opener. Formal dining table for 6 and adjacent breakfast area for 6. Standalone ice maker which makes up to 66 lbs of ice per day. Outdoor large Weber propane gas grill. (6) Spectrum Cable. TV in every bedroom. New large flat screen Smart TV with high definition (HDTV) in family room. One DVD in Den and one in Master Bedroom. VCRs in Nautical Bedroom and Lighthouse Bedroom. Toy box with toys for young children. Pool toys for everyone. All your favorite classic children's videos and selection of family videos. More than 35 choices. Large grassy front yard great for children's outdoor games. Second floor sun deck with chaise lounge chairs overlooking the pool and SPA. Perfect getaway and ideal for getting a suntan. 2 person Kayak and child's Kayak available for our guests. Life preservers for adults and children. 4 adult and 3 children bikes ideal for riding on bike paths or riding on the beach. Large deck with dining table for 6 and umbrella. Bar bistro table with 4 swivel chairs perfect for overlooking the pool. New screened porch with second level sundeck overlooking pool and SPA. Life jackets for use with our Kayaks or in pool. Palmetto Dunes tennis center with hard and soft surface lighted tennis and pickleball courts a 2 minute walk away. $5 off court time using our preferred guest code. Synthetic 3 hole putting green in backyard for everyone. 8% to 10% off tee times using our preferred guest code for Trent Jones Oceanfront Course, Arthur Hills Course and George Fazio Courses. 30' free form pool with Spa in private lush tropical setting with lots of sunshine. Can be heated during cooler season. 6 chase lounge chairs for relaxation and sun tanning. Turn on the pool lights and enjoy round the clock swimming. Plenty of pool toys to keep all ages happy. Heated spa adjoining pool swimming pool for year round use. Great gathering space for adults and children. Seats 7. Professional grade synthetic golf putting green poolside with 3 holes, 4 adult and 3 children's Bikes, 2 person Kayak, High chair, Youth bed, Portable-crib, Child safety gates, Family board games, Ceiling fans in each bedroom plus family room and breakfast room, Rope hammock, Private enclosed outdoor shower with overhead and lower faucet for rinsing feet, 6 beach sand chairs, Vaulted ceiling in family room and breakfast room, desks in Charleston master bedroom and Augusta bedroom, loaded toy chest, granite top furniture quality sinks in Charleston master and hall baths, 3 bedrooms on first level and 2 on second level are ideal for two families, mature azaleas and camellias, stepping stone wooded path leads from pool to beach. Boogie boards and skimmer boards ready for use. Beach pull wagon and beach cart ready for hauling chairs and toys to beach. Great place! So close to everything! Had a great time with family! Great house! Plenty of room!! Lovely home! The Barbers were wonderful to work with. Very much enjoyed our stay! The house is very comfortable and roomy. We were 3 generations of 7 adults and 2 children. The property is well equipped indoors and for outdoor activities. The kids really enjoyed the treasure chest of toys. Would definitely stay here again. We had a great time during our stay in Hilton Head. The house was clean, spacious and well-equipped. Additionally, we found our hosts to be very helpful and accommodating. I would definitely recommend. This was a lovely home for our multigenerational family vacation. We had lots of space to spread out. The kitchen was very well equipped; we cooked at least half of our meals and had plenty of table space (over two tables). The movies and games were a nice bonus. Our hosts were very helpful and address our questions right away. All in all, a wonderful place to base ourselves for this getaway! Palmetto Dunes has 3 miles of pristine private beach, 25 miles of bike paths; 11 mile lagoon system, 3 championship golf courses (Arthur Hills, George Fazio, Robert Trent Jones), world class clay court tennis center, gated community with 24 hour security, free Dunes Buggy shuttle service within resort and Shelter Cove. Over 25 golf courses located within 10 miles. World famous Heritage Golf classic on Sea Pines Plantation 5 miles away. Shelter Cove 15 acre marina within biking distance with deep sea fishing, sail and power boat rentals, sight seeing, dinner, nature and dolphin cruises, free live family entertainment nightly in summer, fireworks every Tuesday summer, two large outlet malls, wild life refuge, skate park, historic tours. One hour to historic Savannah famous for mansions, Midnight in the Garden of Good and Evil, Paula Dean restaurant, Founder of Girl Scouts, River Street shops, antiques, and Forrest Gump.